In “A Simple Favor,” Stephanie (Anna Kendrick) is a suburban single mom who does everything she can for her son, especially at school, where she’ll volunteer for anything from cooking to cleaning to decorating. She loves that stuff so much that she also has her own vlog, in which she passes along tips on how to make healthy food for kids, origami, fun with beads, etc. She’s the opposite of Emily (Blake Lively), who does PR for a fashion designer in New York City and doesn’t seem to have much time for (or inclination towards) raising her son. While Stephanie gets her clothes at Target, Emily dresses in more fancy garb and lives in a magnificent house with husband Sean (Henry Golding). The two women meet after school as they’re picking up their young sons, who are friends and want to have a playdate. The boys and their mothers all head for Emily’s home, where the two women begin an awkward relationship. Stephanie is the kind of woman who apologizes all the time and is always careful about what she says, while Emily never apologizes and doesn’t take crap from anyone. But over martinis, the two bond and become friends. Then, one day, Emily asks Stephanie to do a simple favor: pick up her son from school again while she deals with an emergency at work. Stephanie agrees, but becomes concerned when Emily doesn’t answer her calls or texts for several days. Finally, Stephanie calls Sean, who’s in London helping his hospitalized mother, but has no idea where his wife has gone. 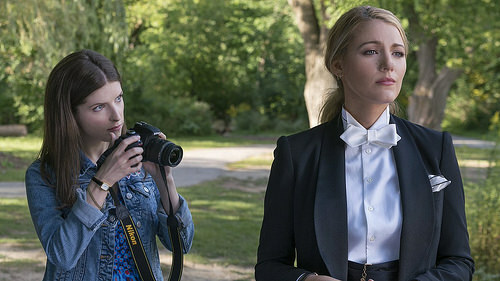 That’s the mystery at the heart of “A Simple Favor,” a rollicking adventure with two terrific performances at the heart of it. Since “Bridesmaids,” his breakout directorial effort in 2011, Paul Feig has shown a knack for giving talented women a platform to prove their comedy chops, from Maya Rudolph to Sandra Bullock to Melissa McCarthy. In “A Simple Favor,” he turns Jessica Sharzer’s script (from a book by Darcey Bell) into a smart, funny comedy with a plot that has enough twists to keep you involved, and two leading ladies who look like they’re having a great time. Kendrick, one of our most reliable movie stars, knocks it out of the park, and Lively does the best work I’ve ever seen from her. They imbue their characters with real personality and share a sparkling chemistry in their scenes together. Unfortunately, Golding gives the same stiff performance he gave as the prospective groom in “Crazy Rich Asians,’ but as in that movie, his wooden presence isn’t enough to slow down the action or the comedy. There are also some stereotypical school parents who are meant to serve as a Greek chorus of sorts but don’t add much. It’s been quite a while since we had a funny mystery movie — you’d have to go back to the previous century for “Foul Play,” “Silver Streak,” and “Ace Ventura” — but even in that sub-genre, the only recent one I can think of is from five years ago: Melissa McCarthy and Sandra Bullock in “The Heat,” also directed by Feig. Hopefully, this will create opportunities for more. At the screening I attended, as the credits rolled and the audience began to leave, the theater was abuzz with smiling people talking about what they’d just seen — an indicator there will be lots of positive word of mouth for this movie. I’ll start the ball rolling by giving “A Simple Favor” an 8 out of 10.